South Florida Pavers Season is Here! Every spring, homeowner demand for pavers and travertine hits a fever pitch. We are ready to serve you and your paver needs. Historically, March through June is the “paver season.” We don’t know why, but maybe it’s tax returns, summer around the corner or folks simply want to invest in their home now so they can enjoy it throughout the rest of the year and into the holidays. In any event South Florida Pavers Season has started. We are a great company to work with. We strive to respond to your estimate requests in a timely fashion. In fact, when you submit your contact information through the contact form on this website, we get emails and text messages alerting us to your inquiry. 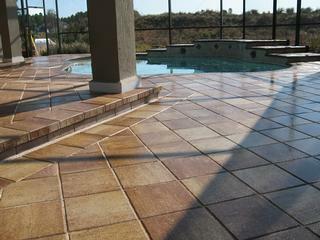 Most of our new clients are looking to install 400 square feet (or more) of South Florida pavers. Sure, we get requests for repairs and smaller jobs, but our primary focus is installing new projects where homeowners are expecting to invest $2000 or more on the job. Part of a great partnership is transparency and these types of paver installations are where we like to focus our time. This spring and summer are a good time to contact us for your paver needs. We service all of Miami-Dade and Broward Counties. Our most popular South Florida Pavers requests are for pool deck remodels, patio pavers (usually extending the existing patio and maybe even adding in a fire pit) and complete driveway tear outs and replacement with driveway pavers. Commerical jobs demand generally heats up (literally) in the summer time once all of the snowbirds have gone back North and condos and hotels are looking to upgrade their properties with new entrances and pool decks. Call us today for a free estimate!